In New England, April can be cruel in a different way. Yes, the grass begins to green and the daffodils rise, but nights can still freeze and windy April showers often chill our bones before they bring those May flowers. The month brings both joy and pain. So it is with Holy Week. As Christians, we set aside this time to live into the harsh cold of the suffering of Jesus during his days of saying farewell, of betrayal, of arrest, of trial, of torture, of excruciating death. By walking with Christ through his Passion – a word chosen to represent the human extremity of his suffering – we prepare ourselves for the joyous surprise, in the words of Madeleine L’Engle, the “glorious impossible” of the Resurrection. Look in these Notes for Calvary for the schedule of Holy Week services, and join us as the “cruelest month” becomes the hour of Alleluia. Abundant blessings & best wishes. Science tells us that we are born of star stuff. Exploding stars created the elements which form our bodies. The sun bathes us in the light that gives us life. Miles beneath our feet the Earth is a mass of molten rock whose waves of heat move the continents in their slow movement around our planetary sphere. Our Wednesday, April 10, we will together explore and celebrate the power of fire and light in scripture and in our earthly lives. We will gather at 6 p.m. for a simple meal. Weather permitting, we will end our time at Dubois Beach at Stonington Point, where the sun will set at 7:22. Please join us as we praise God for the beauty that surrounds and sustains Creation. All are welcome to show up for the Lenten studies. However, signing up in the parish hall this Sunday will help our chefs know how much soup to make. Thank you! In the back of the church you will find copies of a book of the meditations from the last ten years that have touched Episcopal readers the most deeply as they experience their Lenten journeys. You encouraged and welcome to take a copy. Lunch will be served on Monday, April 1st at Calvary Church, 27 Church St., Stonington from 12:00 to 1:30. On the menu is Chicken Marbella with salad, bread, dessert and a beverage. Vegetarian and gluten free alternatives as well as Take Out will be available. The cost is $10.00 per person with the proceeds dedicated to the Jonnycake Center of Westerly providing assistance to those with food, housing, heat and utility needs as well as operating a Thrift Store. Questions??? Call Lucia at 860-912-4144 In case of bad weather the luncheon will be held the next day! 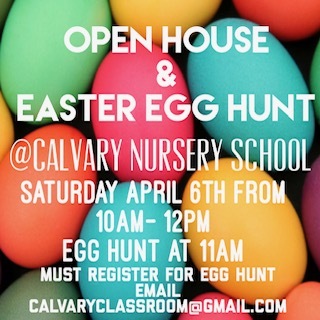 To learn more about Calvary Nursery School click here. The PNC is currently in need of pineapple, soups (chicken, beef, and vegetable), jelly, Spam, clam chowder, pasta noodles, and spaghetti sauce in cans. Rejoice in and give thanks for the miracle of all life that is made possible by the grace of God through water. Come on a River of Life Pilgrimage hosted by the South Central & Southeast Regions of the Episcopal Church in Connecticut, in coordination with Kairos Earth. Pilgrims are invited to move deeply into prayer, contemplation, and movement by canoe or kayak as a community together from May 24-31. For more information or to apply for this opportunity please visit: https://kairosearth.org/pilgrimage/ or contact Rachel Thomas (rthomas@episcopalct.org) or Jo Brooks (jbrooks@kairosearth.org). This year's event will be held Saturday, April 27, 2019 from 9 a.m. to 4 p.m. at Berlin High School, 139 Patterson Way, Berlin, CT. Info, links, and resources on this web page. It's a day in the spring to gather with lay and ordained Episcopalians in CT for training (aka workshops) in various parish ministries as well as workshops that can help deepen your personal spiritual life. Walkers travel about 2 miles over easy terrain in downtown New London, starting from the municipal parking lot across from HHC's thrift store (Homeward Bound Treasures) at 35 Golden St. and ending at the Parade Plaza at the top of Bank Street. Come early and stay afterward for refreshments and entertainment! Link for more information and to register here. Link to Camp Washington for more information and registration here. On April 8, May 6, and June 11, the Episcopal Church is offering an introductory webinar to all interested in learning more about Sacred Ground: a film-based dialogue series on race and faith. The webinar is hosted by Katrina Browne, Sacred Ground curriculum developer, and producer/director of the acclaimed documentary Traces of the Trade: A Story from the Deep North. This Lent, join the Episcopal Church in Connecticut on social media as we embrace the Way of Love. 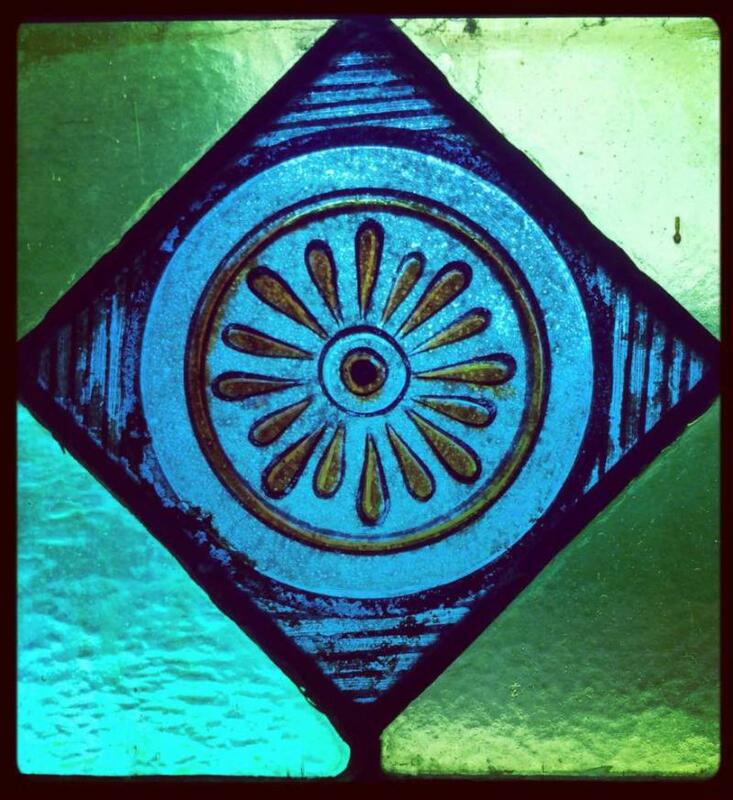 Each week ECCT will focus on one word within the Way of Love: turn, learn, pray, worship, bless, go, and rest. There will be video reflections each Wednesday, as well as prayers and intentions throughout the week. Be sure to follow ECCT on Facebook, Twitter and Instagram (especially IGTV – Instagram TV) to participate. Brought to you by ECCT DIgital Storyteller Alli Huggins. It has long been the tradition at Calvary Church that during Lent the United Thank Offering blue boxes appear at the end of each pew. We hope you will each take a blue box home and place coins and bills in it as you remember things for which you are especially thankful, family, friends, good health, sunsets, rainbows, snow (and snow plows) and each new day. The boxes will be collected during services on the second Sunday after Easter (May 5th) and every penny collected will go to grants given by the Episcopal Church to those in need both in this country and around the world. The United Thank Offering program was started in 1889 by the women of the church who collected coins to support grants for mission and ministry all over the world. A wonderful example is a grant given in 1952 to Bishop Gordon of Alaska. It was used to purchase an airplane so that he could reach his scattered parishes. In thanks for receiving the grant he named the plane “Blue Box”. ﻿Envelopes and additional blue boxes may be found at the back of the church if anyone would like to give a single gift. Click on this link for the Safe Church Training calendar for Spring 2019. Periodically, staff and parishioners will have the opportunity to post interesting and entertaining stories about the life of Calvary Church and it's buildings and grounds. We hope you enjoy the reflections. Click on this link to enjoy this new feature of our website. As part of the Adult Christian Education program, Calvary Church offers carefully curated films to be shown in the Parish Hall (unless otherwise noted), free of charge. The Natural: Gifted baseball player Roy Hobbs -- whose life has taken some unexpected turns -- becomes a 35-year-old rookie sensation who helps a cellar-dwelling team get back in the game in this mythic film that's as epic as America's national pastime. We had a lovely time with new friends who found us on our website (see above picture!). Our next gathering will be Sunday, April 14 @ 11:45. So if you are available and would like to join the gathering, please do. No reservations are needed.We enjoy good food, fellowship and conversation. Sponsored by the Prayer and Care Team. Thank you to all who signed up for the refreshment hour. There are still Sundays when you can volunteer to host this gathering. All that is required is set-up, some snacks, coffee and tea. A sign-up sheet and take home instructions are located on the kitchen door in the Parish Hall or contact Evelynn Lyons at 860-535-3286 or at evelynnlyons@hotmail.com. You can listen to our second Sunday service from a distance. Here are directions: Participants should dial 1-857-957-1130 (toll free). Following the voice prompt, enter the access code of 215 866 948#.